2015 Makar Rashi predictions for the Capricorn zodiac sign, point to unexpected good and bad things happening by rotation during the year. Do not depend too much on destiny. Generally, the first half of the year will be excellent while second half will be full of challenges for the Makara Rasi. 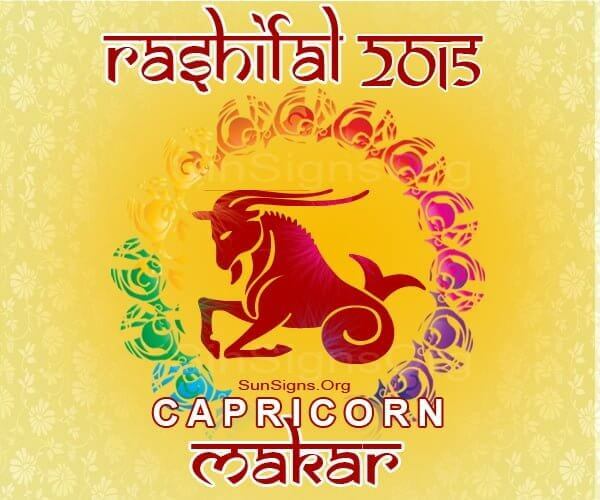 During second half of the year, life might be a drag, predicts the Makara Rashifal 2015. Things might look difficult to achieve. The 2015 Bhavishya Rasi warns that caution is required in all aspects of life. The 2015 career horoscope predictions for the Makara Rashi predict a good first half in 2015. All your ventures will be successful and will be profitable. During second half of 2015, avoid all new projects. Students will do well during the first half of the year. The Makar Rashiphal 2015 foretells that financially you will be in a happy situation during the first half of 2015. All your projects will be profitable. Second half of the year will be turbulent. You should avoid getting into any new projects. As expected, 2015 Makara Rasi predictions show that love will be exciting during the first six months. People in committed relationships may think of marriage. Makar Rashi 2015 astrology forecasts for family suggest a happy environment during the first half. You may be able to move into a new residence or buy a vehicle of your choice. There will be celebrations and religious functions in the house. During the second half of the year, you may lose your self-control and indulge in immoral things. This may cause embarrassment to the family. The 2015 Rasifal warns that travel should be avoided in the latter half of the year. The Makara Rasi 2015 forecasts show that health problems might occur during the second half of the year for these natives.